I am a frugal shopper. Anytime there are coupons available for what I need, I'm going to search for a match-up. Deals may not be as good as they use to be, but you can still find some. I even receive discount codes via texts for various companies: Rack Room Shoes, Sonic Drive-In, Goody's, Payless Shoes, Kangaroo gas stations...Some of the discounts sent via text are amazing! For Example: Goody's often sends out discount codes for 40% off one item. You can use these codes on clearance items unless specified otherwise. You may not be able to save much on meat and produce, but you can generally stock up on the extra's. For meat and produce, check around for the best deals. Anyway, here are the deals I received today! After paper coupons, digital coupons, mega sale, store sale, markdowns, Savingstar rebate, and a $10 rebate from a Loves purchase (Visa gift card), all of this came out to around $32.30 out of pocket. This is a substantial savings! Some may ask why so many of one item. My question would be, why pay full price later for something you will need or want anyway? I only paid .99 per pack of Kotex Overnights. If your household uses 2-3 packs a month, wouldn't it make sense to save up to $4 per pack? (Prices may vary by location). 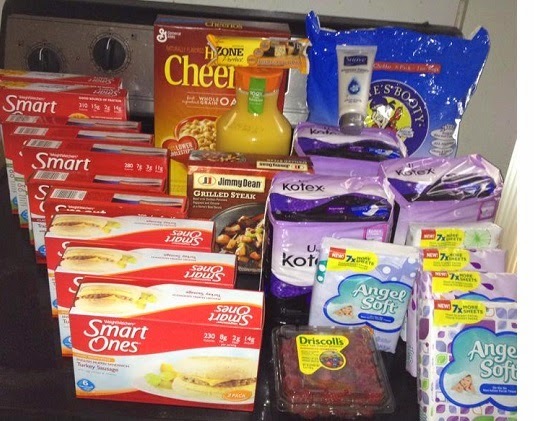 Or if your household consumes snacks daily, wouldn't it be wise to stock up while there is a great sale? There is absolutely nothing wrong with stocking up. Don't let anyone tell you differently. There is a HUGE difference between a stockpile vs. hoarding. Everything from this list came from Kroger. My advice is to definitely spend a little time researching coupon match-ups. Utilize your rebates/refunds in useful ways, and look into rewards programs. As I mentioned in a previous blog post, I visit a coupon forum often. weusecoupons.com has been my "go to" coupon community since 2011.